what about the plastic animals? : Mike Mulligan, where are you? Mike Mulligan, where are you? Mary Anne has important work to accomplish. 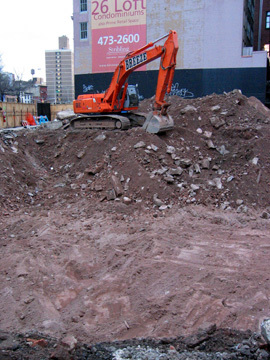 Like digging out the foundation for the residential building that Cooper Union is building at Astor Place. Cooper Union was founded by inventor and industrialist Peter Cooper (1791-1883). Before there were cars and trains there were lots of horses in New York. Something had to be done with the horses when they died. Cooper bought a glue factory in 1822. In 1845 Cooper was issued a patent for flavored gelatin, possibly invented by his wife Sarah. Cooper's heirs sold the patent to Pearl B. Wait of LeRoy NY. Wait eventually changed the name to Jell-O. Peter Cooper designed built the first steam locomotive in the United States. He was also instrumental in the laying of the first trans-Atlantic cable. He became one of the wealthiest men in America. Cooper had almost no formal education and could not spell. He founded Cooper Union so that working class men and women could get an education. Cooper Union does not charge tuition. Biography from All Souls Church. Chapter 24 of "The History of the First Steam Locomotives in America". Biography from the Cooper Union Department of Chemical Engineering and Department of Chemistry.